Blue Apple Books, 9781609050627, 36pp. Tom Slaughter is the illustrator of several books for children. In addition to his work as a book illustrator, he has also designed posters, playbills, watches, and T-shirts. Tom's artwork has been shown in solo exhibitions around the world. He has worked in collaboration with Durham Press, and his prints are in the collections of the Museum of Modern Art and the Whitney Museum of American Art. He lives New York City. 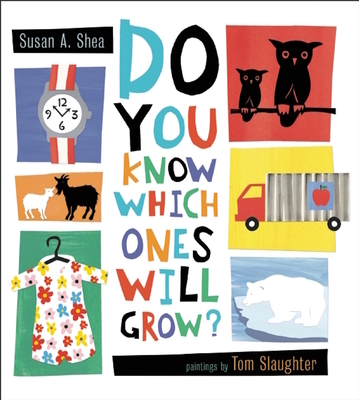 Susan A. Shea makes her children's book debut with Do You Know Which Ones Will Grow? Susan, a former teacher, shared her love of reading with elementary school students. Now she lives on Cape Cod with her husband. When she's not writing or traveling, she photographs things that grow.